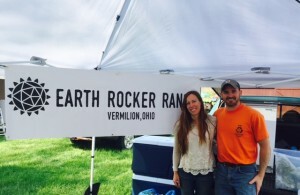 Earth Rocker Ranch is a small farm in Vermilion owned and operated by Rosemary and Aaron Walker. We view our farm as something of a natural ecosystem, where everything has its place and everything works together to provide us with healthy food and a cool place to live. 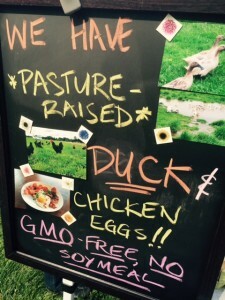 We have a small herd of beef cattle, and egg-laying chickens and ducks. All of these are raised on pasture, with the poultry receiving a small amount of supplemental GMO-free, soymeal-free grain. The cattle provide us with meat, are helping to restore our pasture to lush abundance, and “mow” the grass to provide a space for the chickens and ducks. The chickens and ducks also eat lots of pasture plants and help to decrease pest insects, and provide us with eggs. In the pasture we have also planted rows of several hundred fruit and nut trees, which will help feed not just us and our customers, but also our livestock in the future. We are excited about being able to provide a local source of totally natural, pesticide-free fruit, but that will be a few years down the road when the trees are big enough. Right now, it’s just exciting to see how big the trees are already getting. This year, at the Frostville Farmers Market, we are focusing on providing healthy, all natural vegetables and pasture raised eggs, as well as some cut flower bouquets as they come in season. 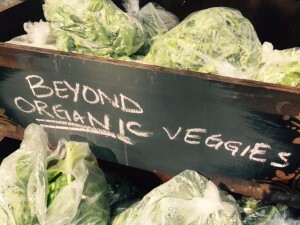 Regarding vegetables, plant health is actually not all that different from human health. We all need complex carbohydrates, and healthy fats and proteins. Healthy plants are able to make complex carbohydrates when they have all the nutrients and light they need for photo synthesis. When these carbohydrates are abundant they build resistance to soil pests and can transfer plenty of sugars to beneficial microorganisms in the soil. These microorganisms release nutrients back to the plant so that the plant can produce complete proteins. These healthy protein-rich plants will then have resistance to other pests such as weevils and aphids, and they are able to store excess energy. Excess energy is stored in the form of lipids, or fats and oils. Lipids help plants develop strong waxy coats that impart further disease resistance to things like blight. Once the plant is this healthy, it also produces special compounds such as polyphenols — those things found in “super foods” that impart flavor, nutritive value, and resistance to chewing insects like Japanese beetles. At Earth Rocker Ranch, we use a crop-specific and complex regimen of soil builders, trace minerals, and organic-approved foliar feeds to make our plants as healthy as possible, so they are as nutritious as they can be for you! We are finding that our greens last a long time – like a couple of weeks or more – as long as you keep them refrigerated. That is in part because they are harvested so quickly before being sold to you at the market, but also because the plants themselves are so healthy and have strong disease-resisting structure. Don’t hesitate to ask us for any recipe tips or ideas when you are at our stand, see you at the Frostville Farmers Market!